Inspiration for this project came from here. Instructions: To view the inside pages, click here. Folded Pages: Cut 5 8 inches x 8 inches papers from the Camelia Carnation paper collection. Remove a 3.5 inch by 4 inch vertical section from the lower left corner of each piece of paper. The remaining 0.5-inch area serves as a tab to hold the pages together. Fold each paper in half vertically and horizontally. Create a mountain fold in the lower right quadrant. Close each of the five pages with the two valley folds and angled mountain fold on the inside. Apply glue to the flap. Fold the flap up to secure to the left panel of each of the decorative pages. Stamp with sayings from Words of Encouragement, Words of Comfort and Today's Quotes stamp sets prior to assembly of the pages. Adhere each of the five pages back to back with glue. Book Cover: Cut two 4 inches x 4 inches chipboard and two 6 inches x 6 inches pieces of Camelia Carnation paper. Wrap the chipboard pieces, which are the outside covers, with the paper. Adhere glue to the front and back pages of the book and adhere these to the covers. Stamp, die cut, and color with the dauber and Stampin up Peekaboo Peach ink a total of eleven small variety of the Camelia Carnations with Small Camelia Carnation and Large Camelia Carnation Cling Stamp and die sets. 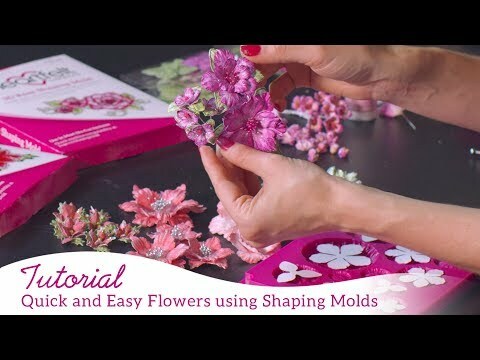 Shape them with the deluxe flower shaping kit. Arrange and glue the flowers in place on the cover image. Apply Minnie Pearls Prills to the tiny white flowers on the cover image.